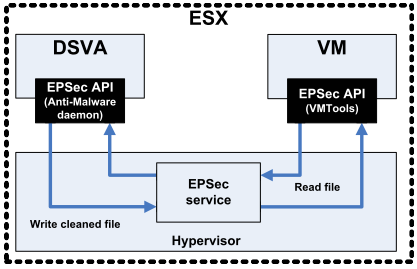 Deep Security use of version 8.0 which was installed on the vSphere 5.0, currently we have 9.0 sp1 on vSphere 5.1. In January, comes version 9.5 which will be fully compatible with vSphere 5.5. Currently, our license covers all the modules, but we know that version 9.5 will be extended for another, including those that allow you to scan in terms of security web portals (such as holders of the portal, we are going to test all the new products). 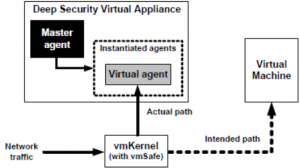 Deep Security provides complete protection of the environment in a virtual (and physical), including protection of virtual machines in the “no agent-based.” DSM installation itself is simple . 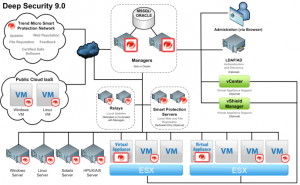 Configuration is intuitive , take a look at it with the ” Best Practice “. I am a long-time user of this product, with superior experience, I would like to share here some thoughts. I’m also a big fan of this solution but I look at them quite critically on the grounds that quite a long time to stabilized, and at one time gave us a bit of bone. Protection “agent-based” rather not have to explain. In this post I would like to mainly “crack” the protection of agentless around which accumulated some myths. Unfortunately, as always, marketing does not present the whole truth, and some of the details you can learn just … in training. Protection without agents provides DSVA, appliance that must be loaded on each ESXi host. 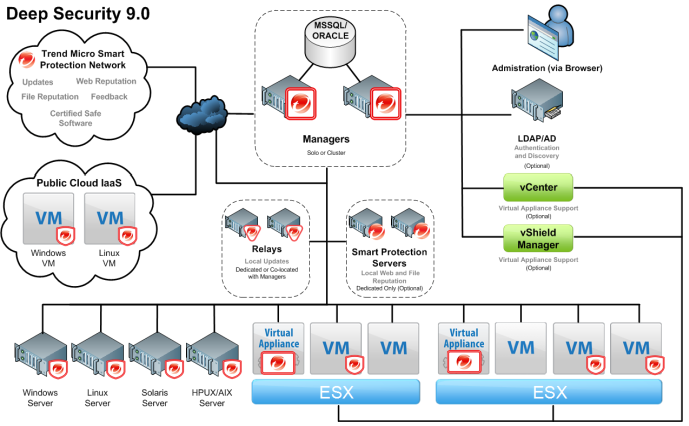 DSVA communicates with the vSphere API through appropriate, therefore, needs to act vShield Manager and the presence on each host ESXi loaded vShield App. A virtual machine must be installed and operating correctly VMware Tools (with driver vShield Driver is not installed by default!). If any of these components does not work, protection is disappearing. Exactly, disappears. Under normal circumstances, everything that is related to the operation of a virtual machine is further filtered by DSVA (just called the driver that you install on each host – filterdriver). 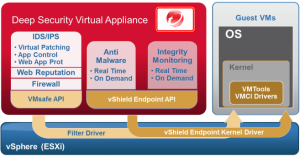 Not acting DSVA (eg after reboot the host turns out that it is checked out of the vShield Manager) does not see the machine (offline) and does not interfere with its operation. The rest of the communication is done properly, hence the disappearance of protection. 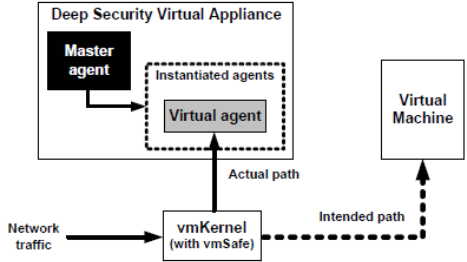 This is a good site, failure of Deep Security Manager and Deep Security Virtual Appliance will never cause that our environment will cease to operate. The downside is that if you want to KEEP protection in the event of a failure, we need to install the Agent. What really is DSVA? 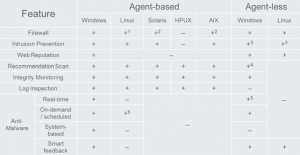 It is a Linux machine (we have there full of insight) which are run more instances of agents (for each protected virtual machine). 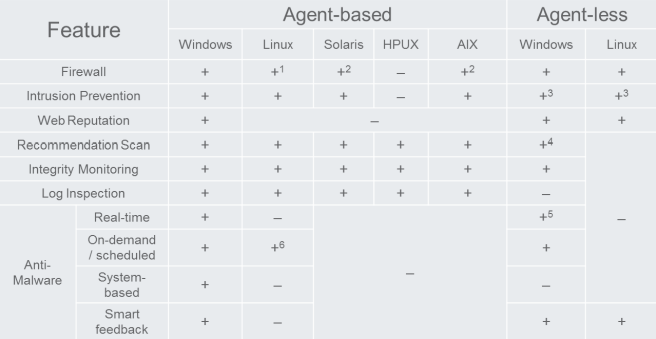 So yes, agentless protection is done using … Agents! 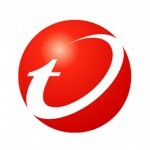 Agent installed locally can do more, use of technology and experience earned over the years with products such as Titanium Security (I mean mainly the protection of Windows). The technology which is used is the AMSP, or Anti-Malware Solution Platform. AMSP is a modular technology based on plugins, using engines Virus Scanning API (VSAPI), Spyware Scanning API (SSAPI) and the Damage Cleanup Engine (DCE). And that DCE is what distinguishes Agent of DSVA, DCE is directed against threats residing outside the system files (memory, registry and other components such as Layered Service Providers). And here we come to conclusions. Do agentless protection is a myth? Definitely not! Deep Security, by DSVA provides almost immediate protection of the whole virtual environment. Implementation of the Deep Security can be done in an hour, the initial preparation of the policy and its sending a few minutes. Literally the moment we have enabled virus protection on dozens of machines. Scanning machines for recommendation a few minutes, the inclusion of a recommendation (virtual patching) and redeploy the policies that minute. Within 24 hours, we can perform a full scan machines for anti-malware (depending of course on how much they have). There is no faster method in complex environments, it does not make sense to install the Agent on each machine. We have adopted the principle that agents are installed only where the threat is greatest. Equipment exposed directly to the Internet (website), machinery back-end machines, which must meet certain requirements, such as PCI Commpliance. And at the end of the machine VDI in pools of type Full (yes, no trust). I am new to TM DS. Recently i completed my TMDS classroom training. Planning to attent the online exam on TrendMicro. Is the exam is too hard, can you tell me some helpful tricks for the exam? By the way, i read your articles above about TMDS. very cool. Glad to see your reply. I am new on TM Deep Security, though i tried to study those classroom video deeply and student guide also i have, then also kinda confused. Now kinda relaxed as you are assuring me that exam is very easy….. But you are very experienced guy for a long time, so may be for you it’s easy. Just saying. I passed the TMDS exam, thank you very much. 1. professional way – How many servers i need to deploy those above softwares ? 2. Suppose I have 2000 users, in this scenario, may i install all of those softwares in one server and TMCM in another server? wish to have your help on it, please. 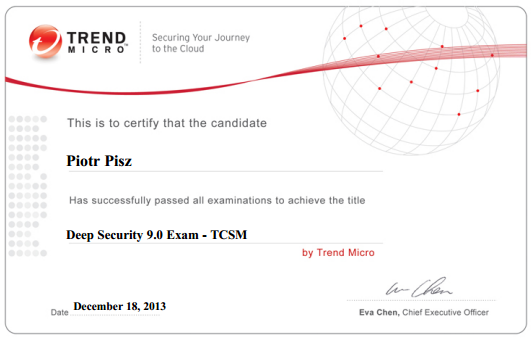 Congratulations, unfortunately I have no experience with TM Smart Protection for Endpoint.